This super-concentrated version of Soyagen offers the full benefit of Soyagen, plus 40mg of fully fermented bio-transformed isoflavones and the advantage of a whole soya food (not just an extract as with most products). What is True Food SuperPotency Soyagen? SuperPotency Soyagen is made by a process of bio-transformation in which whole organic soya is activated by a culture of Saccharomyces cerevisiae, significantly increasing the concentration of active isoflavones. Many Soya supplements declare their total isoflavone content, while their "active" isoflavone content may be lower. 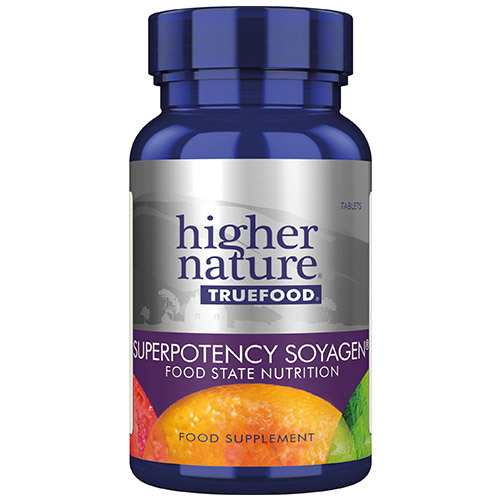 SuperPotency Soyagen also supplies Beta glucans, Glutathione, Choline, Inositol, B vitamins, Amino acids and other phytonutrients naturally found in the rich food base of a Saccharomyces cerevisiae culture. Isoflavones are polyphenolic compounds produced almost exclusively by the members of the bean family. Because of the way the True Food products are made and absorbed in the body, they do not have to be attached to a carrier. The body sees the True Food complexes as food, which means there are many more opportunities (i.e. receptor sites) for absorption in the digestive tract than there are for regular supplements. Enzyme pre-digested whole soya fermented with Saccharomyces cerevisiae, anti-caking agent: stearic acid*; anti-caking agent: silicon dioxide; anti-caking agent: magnesium stearate*; coating: methylcellulose, natural vanilla flavour (agave syrup; flavour: vanilla extract; colour: caramel). Adults take 1 tablet a day, with or between meals, or as your health professional advises. Below are reviews of True Food SuperPotency Soyagen - 90 Tablets by bodykind customers. If you have tried this product we'd love to hear what you think so please leave a review. Question about True Food SuperPotency Soyagen - 90 Tablets Are the True Food supplements suitable for those with an intolerance to yeast? Question about True Food SuperPotency Soyagen - 90 Tablets Are the nutrients in the True Food range synthetic? Question about True Food SuperPotency Soyagen - 30 Tablets Are the True Food supplements suitable for those with an intolerance to yeast? 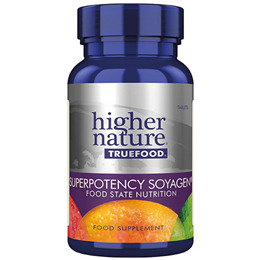 Question about True Food SuperPotency Soyagen - 30 Tablets Are the nutrients in the True Food range synthetic? This super-concentrated version of Soyagen offers the full benefit of Soyagen, PLUS 40mg of fully fermented bio-transformed isoflavones and the advantage of a whole soya food – not just an extract.